When British troops invaded Afghanistan in 2001 together with the U.S., it wasn’t the first time, or even the second or third. It was Britain’s fourth Afghan war and one which happened because, tragically, no-one in Whitehall had learned a thing from the last humiliation, in 1919. The third Afghan war came about in the aftermath of the First World War and was the first time Britain attempted to hold down its Empire using technologically sophisticated weaponry – an attempt that failed then just as it failed today. The wild and arid hill country of Afghanistan, with its legendarily tough fighters – men and women alike – had been a pawn in Britain’s geopolitical game for a century. Britain was convinced that without Afghanistan as a buffer state, the Russians would infiltrate the region and start nibbling at India – the most lucrative part of the Empire. Some Afghan warlords also had designs on enlarging their territory at the expense of British India and made full use of the difficult terrain in the North West Frontier region to carry out cross-border raids, kidnapping rich merchants for ransom and similar lawless activities. Britain had already fought two vicious wars to maintain its political dominance over Afghanistan, in 1838-1842 and again in 1878-1880. After both victories she had withdrawn her armies and fallen back on the tried and tested formula of maintaining peace by installing a puppet monarch – titled Amir – and paying him handsome subsidies to toe the British line – a solution with a still-familiar ring to it. The consequence of these wars was that Afghanistan ceased to have any real independence politically and her foreign policy was controlled by Whitehall. However, the last such pliable rent-a-khan died in 1901, and was succeeded by Habibullah, who saw no necessity in 1918 to bow the knee to a Britain weakened by war and who was encouraged by Turkey to throw off the shackles of British tyranny. Habibullah was more entrepreneurial than his predecessor and saw an opportunity of making money from both the British and the Russians by playing them against each other. The result was that the region became even more lawless and unstable. In February 1919, Habibullah was assassinated and succeeded as Amir by his son, Amanullah Khan, who was even more anti-British and even more ambitious than his father. A perennial source of contention between London and Kabul was the border region with British India. As well as being inaccessible and inhospitable to anyone but the Pathan, or Pashtun, tribespeople who lived there, ownership of this mountainous region, key to the vital Khyber Pass, was disputed. Even the British themselves were not clear about the area, as they had not one but two borders, an administrative border and a line on the Map known as the Durand Line. The ambitious Amir Amanullah now decided not only to ignore Whitehall’s directives on foreign policy but also to take back land on these disputed borders which he believed was historically Afghanistan’s. The British Foreign Office remained convinced that without Afghanistan on its side, Russia would start to annex parts of India. They believed this despite the fact that the Russian Army had been almost completely destroyed by the Germans in 1914-15 and that the revolutionary government that had taken over control in Russia in 1917 could scarcely control the population within its own borders, much less embark on overseas adventures. Whitehall also believed that Amanullah’s new Afghan regime was actively fomenting rebellion in the northern states of British India – to use modern language, that the region was home to terrorism. You can almost hear the outrage in Curzon’s voice at the mere idea of the Amir of Afghanistan presuming to declare his country independent of British rule. Accordingly, Britain decided to invade Afghanistan for a third time, to bring it to heel. But unlike the previous occasions, it would not send a vast army of men and their supplies. This time it would send a smaller, highly-mechanised force, and rely to a large extent on the new weapons to do the work of thousands of enlisted men. Chief among the high tech solutions deployed would be the new aircraft, which could bomb and strafe tribesmen from the air without fear of retaliation. A short, sharp shock of modern mechanised warfare would soon bring these ignorant, turbaned mullahs to their senses, and to the conference table where they could be once again bought off. That was the theory as seen from the Foreign Office’s magnificent Durbah Court in Whitehall. To someone brought up in the beautiful and temperate landscape of Britain, Afghanistan must seem like one of the worst places on earth. It is what you would get if you transported Switzerland to the middle of the Sahara Desert. Temperatures drop to minus 15 degrees in winter and can exceed 120 degrees in summer. The terrain is a barren, arid, rockscape, with rugged mountains almost everywhere, permanently topped with snow. It is as empty and dry as the Sahara, as rugged and inhospitable as the Himalayas, as hostile as the Arctic circle. Boiling by day and freezing by night, it is even today a deeply alien and unfathomable country. Its hill-tribe inhabitants are taciturn, long-suffering, natural guerrilla fighters who – despite the countless conflicts fought over their land – have never accepted defeat and who remain endlessly, stubbornly, willing to fight and die for their country. Grim though this warning may sound, Kipling was actually glossing over the realities of war on the north west frontier for fear of offending Edwardian middle-class sensibilities – realities that were considerably worse. It was not uncommon for Afghan women to bury a wounded British soldier up to his neck in the ground, force his mouth open with a piece of wood, and then take it in turns to squat over the victim, urinating in his mouth until he drowned. Presumably this kind of cruelty was intended as a deterrent to those minded to make war on Afghans. No doubt it would have been effective on other hill tribesmen. But to a western power intoxicated by its technologically sophisticated weapons, it merely gave them a blank cheque to retaliate with even greater cruelties themselves, such as the bombing and strafing of women and children from aircraft, and the bombing of the defenceless capital city, Kabul and its royal palace. On paper, the third Anglo-Afghan war of 1919 should have been a pushover. The forces deployed included two RAF Squadrons – 31 Squadron flying BE2s and 114 Squadron flying BE2s and Handley Page bombers. The BE2, a biplane, had been replaced as a front line aircraft at home and was obsolete since it was no match for the new generation of single-wing fighters in terms of speed or height. But Whitehall believed it would still be devastating against hill tribesman armed with home-made rifles. The Handley Page bomber was a current front-line air weapon – the aircraft that had bombed Berlin and the Zeppelin yards at Kiel. The aircraft were to be backed by Rolls Royce armoured cars and automatic weapons, mainly Maxim machine guns and Lewis guns. Troops would also be heavily armed with innovative weapons such as the Mills hand grenade that had proved so effective in the Flanders trenches. Command and control would be maintained via military wireless sets, telegraph and field telephone. The Government also considered using poison gas to suppress the uprising but decided against it – probably because gas weapons then required a static target as in trench warfare. There was one cautionary note sounded in the British preparations. Afghanistan had no railways and only cart tracks for roads. Wheeled vehicles were few and far between. Supplies and ammunition would have to be packed in by mule or camel train. It wasn’t going to be all high-tech warfare. There was still a lot of old-fashioned foot-slogging to be done. Their opponents, the Afghan regular army, were an ill-trained and poorly-led bunch. Pay was low and desertion was commonplace. 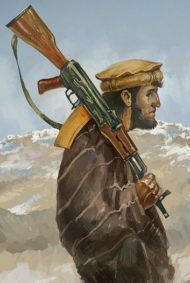 However, the Afghan government had one ace up its sleeve: the 80,000 or so tribesmen it could call upon in time of need, and who were only too willing to put their local knowledge of the mountains, and their long-barrel rifles, to good use, ambushing and picking off foreigners struggling through mountain gorges in the heat and the dust. Once operations began in May 1919 it soon became clear that the war wasn’t going to be the high-tech duck-shoot that Britain’s Army High Command imagined. All of the new weapons proved to have drawbacks in Afghanistan that they did not have in Flanders. Maxim and Lewis guns can fire thousands of rounds of ammunition while the enemy is still reloading his rifle. But those thousands of rounds have to be carried to the battlefront in the hills by mule. Once the ammunition belts are empty, the automatic weapons are scrap metal. The hand grenades that worked so well in the trenches were a disappointment in the mountains. Many didn’t explode. Many more broke open on the hard rocky surfaces on landing. And because the men had not been properly trained in their use, a large proportion of them were thrown without the pin being pulled – something the tribesmen quickly cottoned onto and started collecting and re-using grenades. The heat and fine dust spelled trouble for the armoured cars. They constantly broke down and the temperature was so high that their occupants could not close the hatches without suffocating in the heat, so they drove with them open, inviting attack. It was the use of aircraft to bomb natives that was controversial. Small numbers of planes had been used in 1916 and 1917 to drop bombs on tribesmen. But this time there were whole squadrons of aircraft. In practice, the fighter aircraft scored some successes in driving tribesmen away from joining the scene of battles, but like the rest of the new technology, they did not live up to expectations. Their reconnaissance role was soon negated because the tribesmen quickly became adept at breaking into small groups and hiding or blending into the hillsides when they heard aircraft engines. This resulted in pilots on scouting patrols making intelligence reports that areas were “clear” which in fact were swarming with tribesmen. Even worse, the operational ceiling of the aircraft was limited by ferocious dust storms and air turbulence. Tribesmen learned to climb high into the mountains and fire on them from concealed positions as they flew past on patrol. One RAF officer wrote, ‘Their rifle fire. . . was uncomfortably like that of a machine-gun, and almost as effective.’ On 30th July a large number of tribesmen gathered in the Khurmana Valley intending to attack British posts. Four aircraft were sent out to locate the guerrillas, one of which was shot down by a party of riflemen who had climbed the hillside. It was not the only aircraft to be shot down or put out of action by the guerrillas. Finding that their aircraft were vulnerable and their attacks on tribesmen were not producing the effect they expected, the RAF decided at the end of May to escalate the battle to King Amanullah in person. A Handley Page bomber flew to Kabul, flew over the Royal Palace and dropped four bombs. The attack caused little damage but did terrify the inhabitants. Shortly afterwards, Amanullah asked for peace talks to begin at Rawalpindi, and a treaty was signed two months later on 8th August. The way that Squadron Leader Arthur Harris (later commander in chief of Bomber Command) told this story, it was the bombing of Kabul that made the Afghans keen to sign the peace treaty. However, as more than two months elapsed between the bombing of Kabul and the signing of the treaty, during which time the Afghans resisted signing, it was more likely to be the very public shooting down of an RAF fighter by tribesmen with home made rifles on 30th July that hastened the signing just days later. It would not do if word got round that the Royal Air Force could be shot out of the skies by rifle fire. In some respects, the British battle plan was successful over the four months of war. On several occasions, air power caused the tribesmen to turn and run, rather than joining in battle. But this tactical superiority was not enough by itself. A European great power using modern technology ‘should’ be killing third-world natives at the rate of five or ten to one of its own casualties, if not more. In the Third Afghan war the killing equation was reversed. Less than a thousand Afghans were killed or wounded but the British suffered some 1,750 casualties, albeit mainly from disease. The British aim was realised in that the peace treaty signed at Rawalpindi re-affirmed the existing border between Afghanistan and British India. But that was about all Britain got for its 1,750 casualties. The mechanised war had been too difficult and too costly, even with superior weaponry, and Britain had to concede that in future King Amanullah and the government in Kabul would determine Afghanistan’s own foreign policy, making alliances with whoever they chose – including the Russians. It was rumoured, though not proved, that the Bolshevik government of Russia had provided gold to finance the Afghans in their resistance to Britain. Despite threatening to stop subsidies, Britain was compelled to continue to pay Afghanistan or risk losing even the lip service it paid to British authority in the region. Britain chose to depict the war as a victory for Imperial troops, but this view was not shared by everyone, least of all by Amanullah Khan. He had a bronze column erected in Kabul showing the British lion in chains. Moreover, Afghans began to celebrate (and still celebrate) August 19th, the week after signing of the Rawalpindi peace treaty, as their Independence Day. But even if it is interpreted as a tactical British victory, the Third Afghan war resulted in outcomes that were practically all injurious to its long-term interests. Britain’s growing international reputation as a cruel and ruthless tyrant was reinforced in the minds of many, undermining further her reputation for justice, fair play and moderation. This perception was, perhaps, felt most keenly in next door India – the very prize that Whitehall was trying to hang onto by going to war, but whose people were alienated further and radicalised by such a public exercise of naked power. Whitehall and the military clearly considered themselves to be superior to the people they sought to dominate and subdue. The author of the official account of the war says ‘The ease with which the Pathan tribes were raised against us shows how slight is our hold on them in times of religious and racial excitement.’ He also refers to them as ‘bigoted Mohammedans’. It doesn’t seem to have occurred to him that the people of Afghanistan might have a legitimate reason for resenting an invasion by British military forces, and that their reason could be based on something more substantial than being easily excitable foreigners. Britain had simply failed to notice that its Indian empire was starting to crumble, that the world had changed radically around it and that subject peoples no longer believed Whitehall’s press releases. Or, more likely, it did not wish to accept the evidence of its own eyes and ears and was in denial that the empire was in any danger. The effect of this denial and self-imposed blindness was that Britain grasped at the straw of an apparent technical advantage in weaponry to save its empire and, as a result, deliberately saddled itself with the cost and strain of subsidising the unmanageable Afghan state for three decades more, with little corresponding return or advantage – financially, militarily, diplomatically or politically. Most important of all, by embarking on such an ill-judged venture and bungling its use of advanced weapons, Britain suffered the kind of loss of prestige that was bound to accelerate further its decline in the eyes of the world and further loosen its grip on important colonies like India itself. Perhaps, though, the greatest irony of British entanglement in Afghanistan is that when Russia finally did make the move that the Foreign Office had feared for so long and sent its troops into the region in 1979 the result was not the anticipated catastrophe but rather it was the Russians’ turn to become entangled and bogged down in an endless and unwinnable guerrilla war. The Implacable tribesmen who brought about the Russian failure, included many Arabs trained and financed by the CIA, including a young and idealistic Saudi fighter, Osama bin Laden. Empires are often at their cruellest and most arbitrary when they are losing their grip on their subjects. The imperial ruling class will often experience an unaccustomed and discomforting sense of weakness that compels them to lash out in an attempt to restore their former authority. Nothing compelled Foreign secretary Lord Curzon and the Viceroy of India to decide on military action against Afghanistan. They could equally well, without any loss of face, have decided that the new Amir’s demands might have some merit and should be discussed rationally around the negotiating table. But Britain’s imperial government was used to having its own way and did not even consider a diplomatic offensive as an alternative strategy, just as America did not even consider a diplomatic solution in 2001. Extract from “Goodbye Uncle Sam” by Richard Milton.